What sort of content should you publish on your blog to help you grow traffic in your first year? There is no right or wrong answer to that question as each blog will be different depending upon the topic, your writing style and the purpose of your blog. However, I thought it might be fun to look back at some of the earliest posts that I wrote on Digital Photography School and talk a little about how each contributed to the growth of the site. 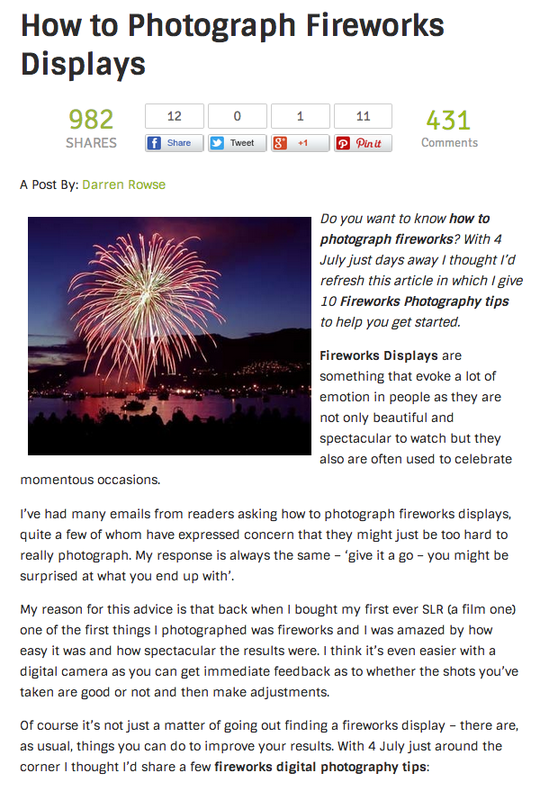 What follows is a selection of posts that I published in the first year of Digital Photography School (back in 2007) and some reflections on how I think they helped grow readership on the site. Note: what you’re seeing here is how the posts look today. We’ve been through 3 redesigns in that time. 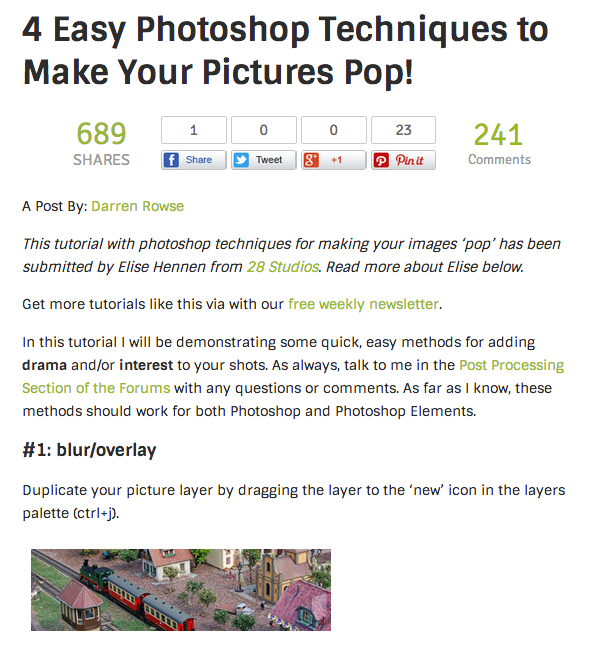 This post was the most viewed post on dPS in the first year (in that 12 month period it had 183,269 visitors). It was published about 8 months after the site launched and was one of the first times I experimented with what I later started to call ‘image collections’. This style of post was a move away from the normal ‘tutorial’ type of posts that I did. While the majority of the posts on dPS were ‘information’ heavy this post was almost completely images (a series of 15 of them) and it highlighted the importance for me of ‘inspiration’. One thing I’m glad I did in this post was to link it back to a previously written ‘tutorial’ that I’d written on the same topic (which I did in the first paragraph). This led to some decent traffic to that ‘information’ heavy post. This post was something of a slow burner in terms of traffic. It wasn’t until 4 weeks after I published it that it suddenly saw a rush of traffic from StumbleUpon and Reddit (peaking at 27,000 visitors in a day). Two years after I published this post I gave it an update and reposted it to the front page of the site. This resulted in another great spike in traffic to the post as at that time it was featured on the front page of Digg (bringing in 24,000+ visitors in a day). In 2010, the post again had a spike of 15,000+ visitors in a day after being linked to from another large site. This post has continued to get traffic every day. It’s not spectacular daily traffic (it has averaged 100 or so visitors per day over the last month) but when you think about the long tail life of this post it adds up. The post has been viewed 786,547 times since being published. 4 Easy Photoshop Techniques to Make Your Pictures Pop! This very early post (published 20 days after the launch of the site) was the one that opened my eyes to the potential of the site on a couple of levels. Firstly, it was the first time the site saw a post go viral from any kind of social media after it was featured on the front page of Digg (which brought in 45,000+ visitors in a day and crashed our servers). Secondly, the post was the first time I’d ever published a guest post. In the first year I did only publish a handful of guest posts and wrote 99% of them myself but this did change my opinion of the featuring other people’s voices on my blog. Thirdly, this was the first ever post that we’d done on the topic of ‘post production’. Up until this point I’d always just published posts that were how to ‘take’ photos rather than how to manipulate and process them in photoshop. Later I went on to add a post production section to the site. What is interesting to me about this post is that while it is now dated (as there are new versions of Photoshop out and new tools available to photographers) it still continues to get decent traffic. The post still regularly gets 200 visitors a day and has had over 1.7 million page views now despite me never really promoting it since the early days of the site (it’s almost all Google traffic). 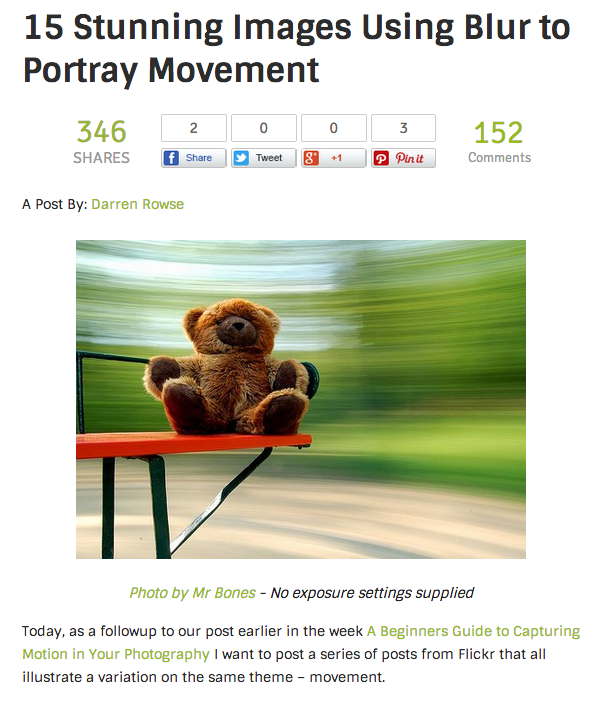 This post is written in a style that has always been popular on dPS – the ‘list post’. As the title suggests there are 11 tips in the post listed. Each point is 2-3 paragraphs long and then most link deeper into the site to other articles that go deeper on those topics. As a result a reader can get a good introduction to the topic but are encouraged to read more of the archives. Scattered through the post are also great illustrative images for the points mentioned. In later years I’ve included larger images and more of them – but this was an early version of this style of post. This post did particularly well on StumbleUpon in the first year after it was published and saw around 148,000 visitors come to the site in that 12 months (half of which came from StumbleUpon). Interestingly I noticed that as a result of StumbleUpon traffic (and a day that it did well on Reddit) we then saw a number of other larger blogs link to up to the post. 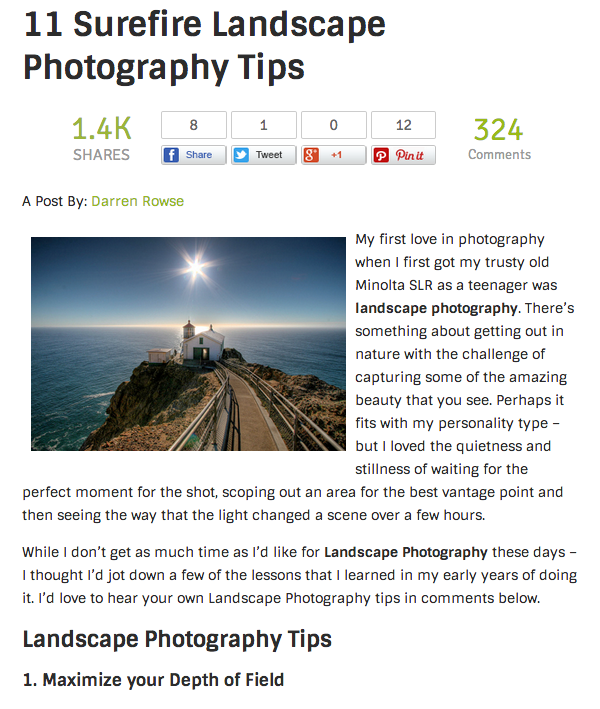 Lastly – for years I have used this post as a piece of ‘cornerstone’ content on the blog and have often linked to it when I mention Landscape Photography in other posts. By linking back to it so many times I was always driving traffic to this post in those early years. Since it was published the post has been viewed over 1.3 million times – approaching 10 times more traffic than it got in its first year after publication! This to me highlights the importance of extending the life of posts in your archives by pushing traffic back to them over time. There are no prizes for guessing what time of year this post went live – that’s right – in the lead up to 4 July 2007 (about 6 months after the site launched). I actually published the post on 26 June to allow it to have time to be indexed by Google. My theory was that there would be a lot of people searching for tips on how to photograph fireworks at that time, and I was right. This post saw only a bit of traffic in its first week but on 4th July it saw 32,000+ visitors – almost all of which came in from Google. I’ve updated this post and republished it on the front page of the site every July since 2007. It is the post that just keeps on giving. Here’s a screen shot of traffic to the site – with spikes every 4th July and New Years Eve. To this date the post has been viewed just under 1.5 million times. The key lesson to me from this post was to consider when you can write seasonal content. We’ve done this a variety of times with Christmas Photography Tips and Halloween Photography Tips posts doing pretty well too. All of the posts linked to above have had spectacular days of traffic but this post was quite unmemorable in many ways. It was on a very beginner topic. I even remember wondering whether I should publish information this basic in those early days. It was a relatively short post on a niche topic that was a part of a series where I looked at the topic of Exposure and covered ISO, Shutter Speed and Aperture. Traffic to the post in the first year never rose above 800 visitors in a day and averaged only 150 per day. But here’s the thing… this post is one of the most viewed posts I’ve ever written and has been viewed just under 2.4 million times since I published it. Where did the traffic come from? The vast majority of it was from search engines. Facebook is the next highest referrer of traffic and it only sent 17,927 views. 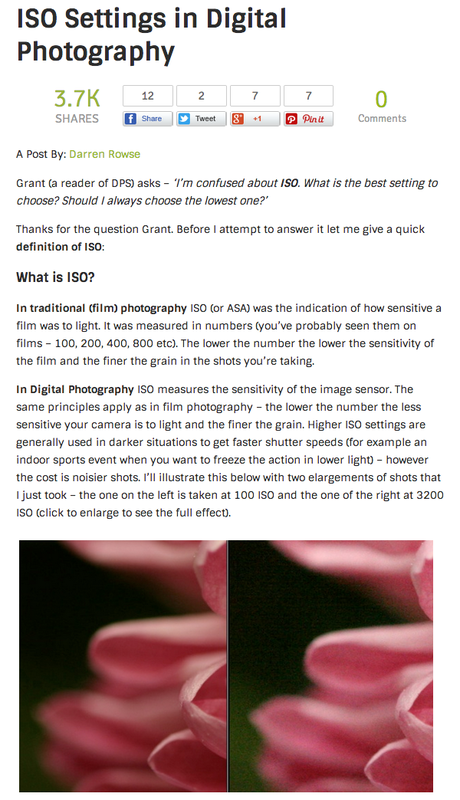 This is another example of a ‘cornerstone’ piece of content that must have linked to hundreds of times from other articles on the site when I mention the term ISO. I did this the same with the Shutter Speed and Aperture posts in this series (incidentally this 4 post series has had close to 6 million page views – I’m glad I wrote it). The key lesson here is that even the most simple concepts are worth writing about. You might think a concept is too basic but there’s no doubt that others will want that information (another example of this was my ‘How to Hold a Camera‘ post that I almost didn’t publish but which has been viewed almost 600,000 times). The other key lesson is that growing traffic to your blog is not always about trying to write shareable content that might go viral. This post is just a simple article that attempts to serve my readers. It wasn’t written with growing traffic in mind – rather it was written to serve my current readers. I do believe that it is wise to write some of your content with ‘finding new readers’ in mind – but the majority of your posts should focus upon serving the readers you already have. What Posts Did You Write in Your First Year that Helped You Grow Your Blog? I have really enjoyed creating this post and have actually gotten some great idea for future posts on dPS from doing this analysis of old posts on the site. I’d encourage you to dig into your own stats and see what you notice about your old posts that have gone well – I’d also love to hear about them in comments below!